In August, IIASA leadership and researchers joined world leaders and academics in Alpbach, Austria to discuss the most pressing problems of our time, including implementation of the Sustainable Development Goals, at a meeting of the Alpbach-Laxenburg Group. As strategic partners, IIASA and the European Forum Alpbach (EFA) launched the Alpbach-Laxenburg Group in 2013. 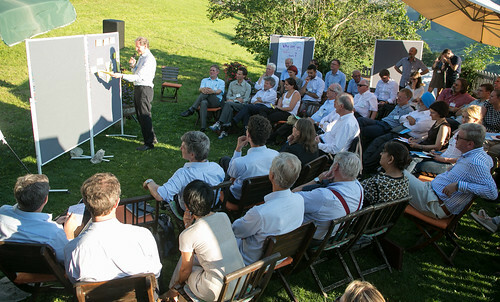 This group held a high-level retreat during the Political Symposium of the 2014 Alpbach Forum to debate the global issues of sustainable development, with at initial focus on inequality and equity. This year leading minds from academia, Governments, business, civil society, and the arts returned to Alpbach for a second high-level retreat from 30 August to 1 September. The agenda focused on supporting the implementation of the Sustainable Development Goals, due to be adopted later this year. IIASA recently launched The World 2050 project, in collaboration with the Stockholm Resilience Centre, Earth Institute Columbia University, and the Sustainable Development Network Solutions, which aims to provide integrated assessments to address the full spectrum of sustainable development challenges. The retreat coincided with the Political Symposium of the European Forum Alpbach, and participants from the Alpbach-Laxenburg Group retreat will presented their discussions in the closing plenary sessions of the symposium. Now in its third year, the Alpbach-Laxenburg Group (ALG), at its 2015 retreat, devoted its expertise to examining the Sustainable Development Goals (SDGs) and, specifically, to meeting the challenges involved in making the transformation to sustainability a reality. The European Forum Alpbach brings together participants from all over the world and from different disciplines, and IIASA scientists participated in a number of events - detailed below. As strategic partners, IIASA and EFA co-organized the Political Symposium, where participants from around the world discuss how united global action is required for issues: such as human security, adaptation to and mitigation of climate change, energy markets, and food security. Two dancers, Gloria Benedikt from Austria, and Hussein Khaddour from Syria will go on a quest of dignity. Biotec, geoengineering, machine learning, and nanotechnology represent scientific progress but also bear existential risk for the future of humanity. Do recent developments in these fields endanger our survival on this planet or are they our only chance as a species to survive the 21st century? 2015 will see the adoption of the Sustainable Development Goals (SDGs) by the United Nations, laying out a very broad agenda of the world community in the fight for global equality. We take a realistic and critical look at the endeavour. Which goals should take priority? Where are synergies and interconnections that can make the implementation of the SDGs more effective? Franz Fischler, President of the European Forum Alpbach, and Pavel Kabat conclude the Political Symposium. IIASA Energy Program researcher Narasimha Rao will participate in a breakout session on the links between climate change and poverty, identifying the most vulnerable groups to climate change, and how adaptive capacity actions can help the development of local communities. IIASA researchers from IIASA's Risk, Policy and Vulnerability Program, Piotr Magnuszewski and Reinhard Mechler, join Lukasz Jarabek from the Centre for Systems Solutions, Wroclaw, to host a breakout session on the variety of new gaming methodologies available did allow policymakers to analyze how problems emerge in Complex Systems and where points of policy intervention may lie. For updates from the Forum follow IIASA on Twitter. The World in 2050 Project (TWI2050) will explore the implications of the necessary transformative sustainable development pathways and the possible ‘degrees of freedom’ to meet economic development goals within a safe operating space of a stable planet. This project will serve the global community with analyses of pathways the world (sectors, nations, communities) can take to attain these internationally agreed sustainable development goals within planetary boundaries, and to monitor progress and success towards their achievement. It will enhance the understanding of the requirements of desirable and feasible sustainable development pathways. This will fill an urgent gap, of analyzing the options, feasibility and consequences (socially, economically and environmentally) of transitioning to pathways to sustainable development. The project will explore avenues to achieve sustainable development pathways, by back-casting from desired development outcomes as defined by the SDGs. The initiative will combine recent advancements in economic modeling and Earth system science to study the interactions between economic growth and global sustainability for sustainable development (SD) pathways. It will use existing global assessments and scenarios (e.g., the SDSN Deep Decarbonization Project) and integrated assessment models (e.g., MESSAGE, IMAGE, and IMPACT/ GLOBIOM/GAEZ) to evaluate the linked impacts of global food policy, ecosystem changes, climate change and energy use. The transformative pathways will serve to identify short-term actions for achieving sustainable futures and their co-benefits e.g. for health or security. Current trends as captured by business-as-usual (BAU) developments will help identify costs and damages of inaction. By integrating several world-class models in key sectors (energy, food, population, education, macroeconomics, biodiversity, climate, etc.) the project will produce paradigm-shifting narratives and scenarios that will significantly expand the capacity to carry out integrated assessments of critical pathways. Importantly the project will examine the interactions among all the SDGs to explore the potential for co-benefits and/or trade-offs of addressing multiple SDGs at the same time, which can provide critical information for policy and investment decisions. This will allow the project to generate the 1st generation of global scenarios that meet the twin objectives of economic growth and planetary stability and thus provide improved evidence, including macro-economic assessments, to political leaders in the SDG process, and other key decision makers, on the feasibility, challenges and opportunities associated with meeting long-term development goals, i.e., development goals that are truly sustainable at a global scale.